Just seeing a book by Jennifer Haigh gives me the chills -- in a good way! I fell in love with her after reading Mrs. Kimble (2003) and I've been hooked since. The premise of The Condition centers on the McKotch family and how they deal with the fact that daughter Gwen has Turner's syndrome, a genetic illness that prevents her body from maturing past pre-teenhood. The novel is apparently about how Gwen's illness affects her two brothers and her parents throughout their lives, but what The Condition is REALLY about is how a seemingly normal family whose personalities couldn't be more different from one another deal with life in general. After reading this novel, I really don't feel as if Gwen's "condition" is what affects her family as the synopsis suggests. Each chapter in The Condition is told from a different family member's point of view, but tells the story of each of THEIR specific lives versus just Gwen, Gwen, Gwen. In addition to Gwen, the main characters consist of Frank, her eccentric, socially-challenged scientific father, Paulette, her rigid, prude, and meddling mother, Billy, Gwen's older brother and a homosexual, and finally Scott, Gwen's younger brother who is terribly unhappy and misguided himself. While my favorite character is Frank because of his good intentions yet misunderstood personality, I really hate Paulette who is sickeningly pathetic. With all the babying and intrusion Paulette bestows on Gwen, it's easy to see why Gwen eventually escapes and cuts ties with her mother. This is not really a spoiler, but you'll understand right away once you get into the book because you can see this separation coming a mile away. My favorite message that The Condition sends is that the people we meet in life can and will often be more important to us than blood-related family members. "Family" should define the people around us that love us and look out for our better interests. It bothers me how present culture places unncessary focus on blood-relations that are, in the end, extremely poisonous to our health and well-being. Gwen makes the right decisions vital to her health and happiness, regardless of what dear Mommy does to try and tear her away from what she loves. 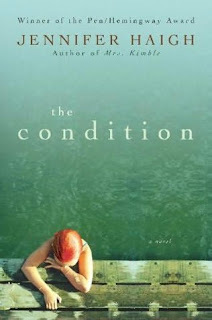 The Condition is smartly written and insightful, but deep and sometimes long-winded. This novel isn't a light summer-read type of book, but something you would definitely need to be in the mood for. It wasn't as easy for me to grasp when I needed a relaxing break or felt tired because this book is full of substance. The ending is perfect though, and the entire experience is pleasantly fulfilling! Well done, Jennifer Haigh ! I remain a dedicated fan. Other novels by Jennifer Haigh include Mrs. Kimble (2003) and Baker Towers (2005).